"still life with the wine cup". Oil on wood panel against veneer. European standard frame format available in all stores. Specialized and / or specific department store departments. In the style of the Dutch style of the 18th century. 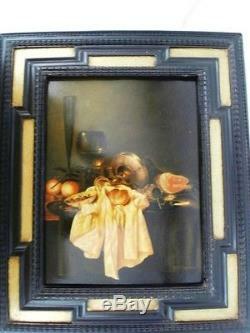 In Dutch style black and gold frame. Remember to visit our shop ... And add us to your favorites! General conditions of sales (prevalents those of the site of sale). All works are carefully packaged by us and shipped within 7 working days from the date of receipt of your payment and / or cashing of your check. The shipping costs, borne by the buyer, are modeled on the current rates of the post office and / or carrier chosen according to the size and weight of the package to which will be included a fixed price (calculated to the fairest) for packaging and handling (bubble plastic, pouch, cardboard, tape etc. Shipments will be made either. At the purchaser's request, an insured all-risk insurance (declared ad valorem) of the parcel price may be taken out initially by the buyer / recipient. Beyond a value of 200 euros and at the express request of the buyer, an insurance "all risks ad valorem" will be taken at its expense per tranche of 100 euros with a maximum ceiling of 1000 euros per package. Important: the purchaser / recipient must imperatively in case of finding damage to the delivery of his package, mention specific reservations on the form and confirm them officially in writing within 3 days (imprecise and general reservations, for example: " subject to unpacking \"Thus, your payments will have to carry out all expenses included". You are advised to ask us the total to pay us before making any payment. For possible returns, the refund will be made by check to your order or transfer within ten working days after receipt of the package returned in r / ar ie in the same shipping terms as our original shipment. We do not accept any liability for performance of the contract due to force majeure such as strike, internet network incident, natural disaster, aggression, flood, fire etc. In case of conflict and outside of any amicable solution highly recommended, the district court of paris will be only competent. These terms and conditions prevail and replace all that may exist elsewhere.) 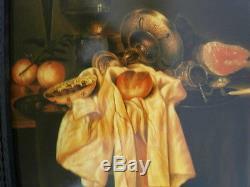 School of the 20th century still life with the cup of oil / wood" is on sale since Thursday, October 6, 2016. 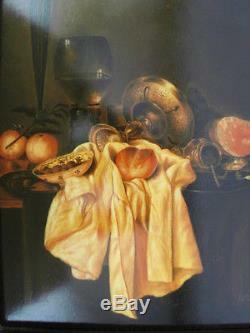 It is in the category "art, antiques \ art of the twentieth, contemporary \ paintings ". 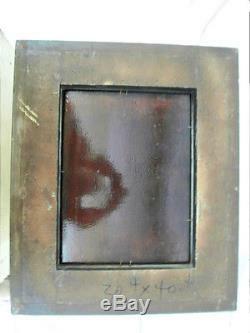 The seller is "lespeintrestemoins" and is located in / in paris.